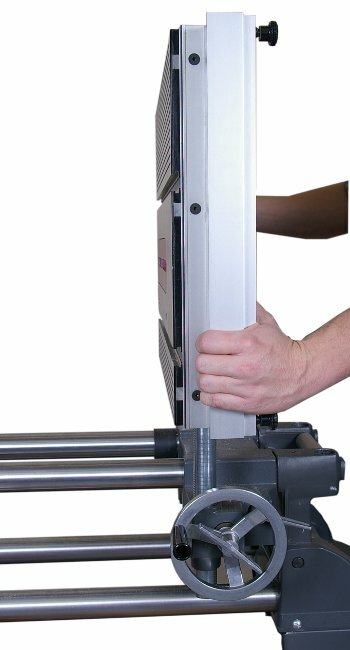 Unique, technologically advanced DVR (Digital Variable Reluctance) motor produces 1-3/4 hp at 120 volts or 2 hp at 240 volts - more than enough power to rout effortlessly into or through the hardest or thickest timbers with ease & no bogging. ...includes a 17" x 22" main worktable plus floating extension tables that let you build support configurations that measure up to 40" deep by 22" wide for handling small or large components with precision & safety. 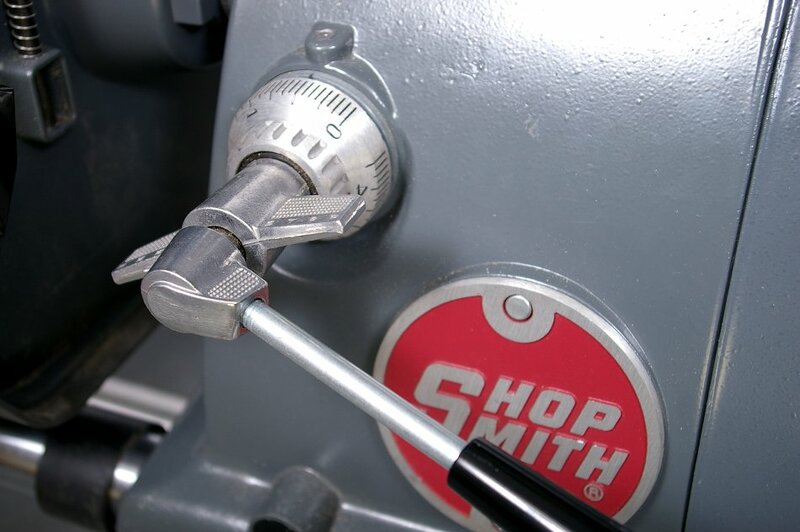 ...from the drill press function lets you plunge your bits up to 4-1/4" deep into recessed workpiece areas. 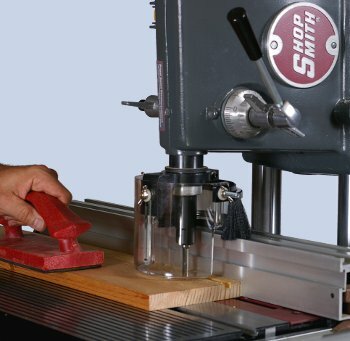 ...lets you rout into your workpieces at an angle... or achieve unique decorative edging cuts with your existing bits that would not be achievable with a hand-held router or conventional non-tilting router table. The Shopsmith Mark 7 gives you a full-featured, over-table stationary router that also works as an under-table version, if you prefer. As an over-table router, the machine is set up with the bit positioned above your workpiece. In this setup, depending on the operation being performed (dadoing, grooving and slot mortising are excellent examples), the operator always has a clear view of the cut as it's being made. Loads of Power and a Broad, Variable Speed Range... You'll enjoy 1-3/4 to 2 horsepower of continuous torque muscle to tackle your toughest jobs at infinitely adjustable speeds from 250 to 10,000 rpm in 1 rpm increments. Reverse Operation... The Mark 7 PowerPro Headstock allows you to cut in both forward and reverse direction. As a result, you can reverse the feed direction of your stock from one side of the worktable to the other, if you prefer. Enjoy a Full 4-1/4" of Plunge Depth Adjustment... Allows you to exploit the full length of plunging-type straight router bits -- or to perform routing operations deep within project components or areas where you have adequate clearance for the Mark 7's 2" diameter quill / spindle. 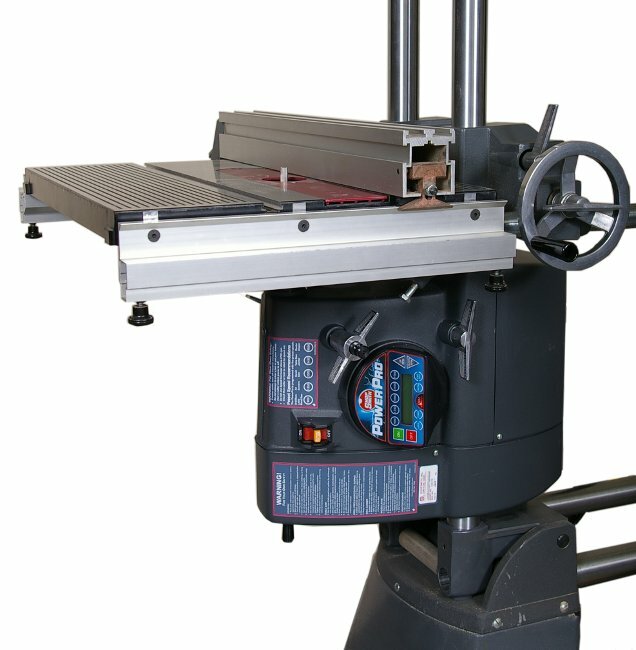 Large, Full-Tilting 17" x 22" Worktable... facilitates angled joinery and decorative cuts that that allow you to create a virtually limitless variety of unique profiles with your existing bit collection. In addition, the table features built-in fixturing capabilities, utilizing the standard rip fence and miter gauge. Can Also be Configured to Work as an Under-Table Router... much like a conventional router table with the bit protruding up from beneath the table surface. When this setup is used, the router shield is mounted to the worktable surface instead of the machine quill... and the hose from your dust collector can be connected to the top of the shield to remove the chips and dust as they are created. But, no matter which mode of operation is chosen, woodworkers who are not normally comfortable using hand-held routers will find that the Mark 7's stationary router has been designed to help eliminate their fears. Its generous sized worktable offers improved workpiece support, as well as fixturing capabilities to help control the stock with matchless precision and safety... and it's full complement of other Shared Features make working with the routing function of the Mark 7 second nature for the operator.